At the RCMP Academy is the Sergeant Major's Parade and Graduation ceremony. RCMP stand at attention during the ceremony. The RCMP stand proudly in their dress uniforms. The RCMP Academy is located in the city of Regina. Sergeant Major's Parade and Graduation ceremony at the RCMP Academy, City of Regina, Saskatchewan, Canada. 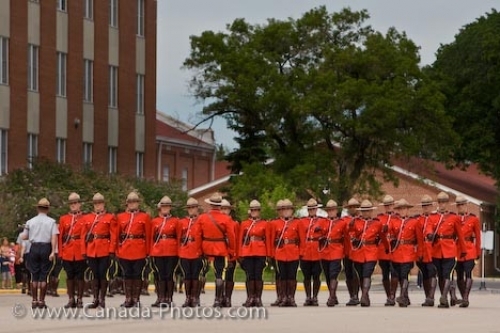 RCMP stand at attention during the Sergeant Major's Parade and Graduation ceremony, Regina, Saskatchewan.